Get your South Carolina insurance license using an America’s Professor online training course. Our comprehensive video lectures, review questions and study guide will help you learn, and retain, the material needed to pass your SC insurance license exam the first time! Thank you so much! With this course I was more than prepared for my exam and passed on the first try! I will definitely be using you again when its time for me to study for the Life, Accident, and Health license. I passed the SC LAH on the first try. The material was similar. But there were many questions on the exam that were not in your test bank. Thankfully, your course covered enough for me to pass. AP RESPONSE: Congrats on passing your exam, DWG! We teach the content listed on the Test Provider's TCO that way our students can answer their exam questions, or make an educated guess. The Test Providers will have many variations of questions testing each point which is why it's important for us to TEACH our students the material. We will never (nor will any other courses) have the same questions in our test bank as what the Test Provider has (big No No). If you feel there was some content specifically not covered please let us know and we will put the Content Team to work! :) Again, congrats on passing your exam. Thank you, Jack...I thoroughly enjoyed your lectures and the organization of your course material. Wish I could have had you for a course in college. By the way...passed my South Carolina exam the first time with a 91+ score! This guy makes it easy for you to remember the information. I took this class, and it went by much faster than P&C! I was able to pass my test on the 1st try with an 88%. you may find him a little goofy and corny at 1st but I am here to tell you that his methods work and that's all I care about! Thank you so much I am now happily working for a State Farm agent and loving what I do! Jack is the man. I watched the vids on 2x and did the course in about 15hrs. Then, took the test and passed. I did read the material beforehand. I skipped a lot of sections and stilled passed. Let's go. #10x baby. Thanks Jack you have great examples and make insurance easyyyyyyyy. The material presented in the course was very beneficial and passing the exam on the first attempt was both encouraging to myself in being successful in the insurance industry as well as testament to how the material was presented in the course videos, text and the quizzes provided. When I first heard about AP, I must admit that I was skeptical. I was previously enrolled in a course that offered a slide show and a few reading materials. I was not retaining the material with this method.. I came to AP especially because of the teaching videos. I learn better when I see, hear, and write the material. During my study at AP, I was able to view the videos and materials several times, which helped me retain the material. I am happy to say that I passed my exam on the first try, and had no problems doing so. Even though some of the terminology used on my exam was different from what I had been taught, because I was familiar with the concepts, I was able to pass. I am greatly satisfied with AP's teaching and help! When it came time for me to choose an online teaching opportunity to help me with my insurance test, I looked at lots and lots of different companies. Each of them had something positive to offer. I chose America's Professor because it looked like a very straightforward program. What I did not expect was for the people connected with America's Professor to be so friendly, helpful, and really go above the call of duty to make the process so personal. It's very good to talk to someone about any questions or clarification and their response was always very quickly. I was talking to a real human being. I passed the insurance test on the first try! I fully recommend Americas Professor for all of your training needs. Well these tests are hard not going to lie! They try to trick you with the types of questions they provide. I went over the material (just the video sections) in America's Professor twice. I felt that I had a much better understanding the second time around. I went to take the test and passed with an 81 the first time I took it. I did take the advice of making at least a 90 on all of my practice test at the end of each section video. What can I say this course worked! Thank you America's Professor! If you watch all the videos and take all the quizzes until you can pass then you will definitely pass the exam! It really helped me to read the chapters before watching the videos though, that way I didn't ever feel lost because the information wasn't brand new. I did pass my exam on the first try! Will definitely be using AP for SC LA&H! This was an incredible class. I came into this not knowing anything about insurance, and after finishing the class I have passed the test, gotten a job, and know so much more about insurance! The tests are not easy, this class is a must! I used a different course to study for my Accident, Life and Health exam. I failed it twice and got frustrated. After a little research I purchased America's Professor. I studied about half way through and took the test again. Guess what? I failed again. I took another week and finished the course and guess what? I passed! AP people really do pass! Thanks Jack! OMG........WHERE DO I BEGIN???? AP is so amazing. I had previously passed SC PC and decided to keep going with SC LH. I received extension after extension due to long work hours and didn't think I would complete the course. Two weeks ago I decided to schedule a date to take the course with over half of the chapters still untouched. Needless to say, I crammed late nights and early mornings and did not skip out on my test today and I PASSED!!! THANKS JACK !!!!!!!! I really enjoyed the series. Passed the first time. The practice tests and reviews were excellent. I enjoyed Morton's dry humor (reminds me of me). I would recommend to anyone interested in passing the exam! Getting your insurance license can feel like an overwhelming challenge, from figuring out where to take the insurance exam, to determining whether there are any pre-licensing course requirements, to identifying your state’s requirement about fingerprinting. America’s Professor is here to help. We’re the country’s preferred insurance exam prep provider. We’ve helped thousands of people launch their careers as insurance sales agents, customer service reps, insurance adjusters, and more. We provide comprehensive online pre-licensing courses to help students prepare for and pass their insurance licensing exam on the first try. Prepare: Once you’ve determined which license you want to obtain, your next step is enrolling in a comprehensive pre-licensing course through America’s Professor to prepare for the exam. Whether it’s required in your state or not, our pre-licensing courses provide you with the essential knowledge you’ll need to pass the exam. AP courses include 24/7 access to a suite of online videos for 45 days, with time extensions at no charge if needed; our courses also include a hard copy textbook designed to complement the videos, as well as practice exams, sample questions, and first-class customer support. Pass: All 50 states require you to be licensed in order to sell insurance or even discuss insurance transactions. As with all states, South Carolina has its own specific licensing requirements—this is why there is a state-specific portion of the exam in addition to a national portion. America’s Professor will help prepare you for both. Apply: Once you pass the exam, you can formally apply for your insurance license, get fingerprinted with IdentoGO (visit: identogo.com/locations/south-carolina) and begin working/selling! 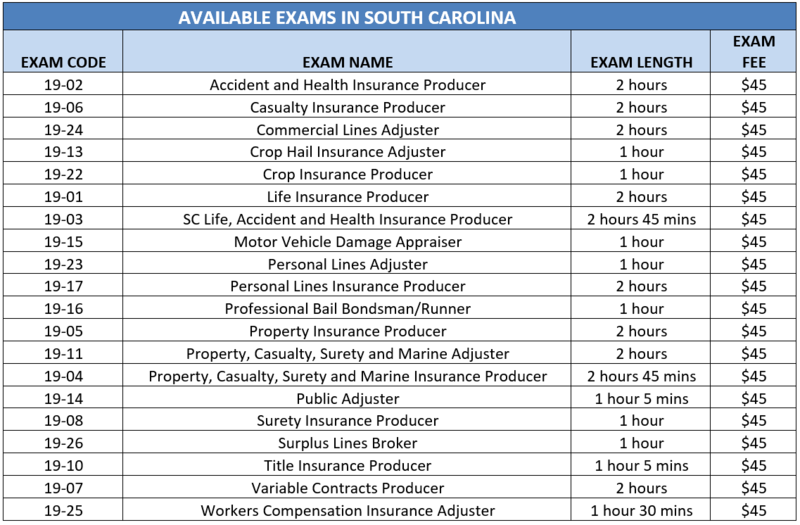 South Carolina offers a range of exams, including a casualty insurance producer exam, an accident and health insurance producer exam, a public adjuster exam, and others. You must score at least 70 on the exam to pass; as mentioned earlier, each exam consists of two parts: a state-specific section, and a national section. The two scores are not averaged together—you will need a score of 70 on both parts. For more information about the kinds of questions they put on the South Carolina exam, which test is the toughest, testing center locations, fingerprinting, and application fees, click here. Exam Registration: In South Carolina, PSI Exams is the company that administers the insurance licensing exams. Call PSI at 1-800-733-9267 to register. Calling at least 3 days in advance of the date you wish to take the exam will help you ensure you get the test date of your choice. Testing Centers: There are several testing centers in South Carolina, as well as testing centers in neighboring states for those who live near a state border. Find a test center near you here. Fingerprinting: Once you’ve passed your exam you must schedule an appointment to get fingerprinted with IdentoGO. Go to identogo.com/locations/south-carolina, click on “State Fingerprinting,” then “Schedule a New Appointment.” Choose “DOI Producer Licensing/Renewal” from the drop-down menu, and then choose a fingerprinting center nearest you using your zip code or selecting your region of the state. You can also schedule an appointment by calling (866) 254-2366. Licensing Application Fees: The South Carolina Department of Insurance charges a $25 license fee for most license types, and licenses must be renewed annually. America’s Professor has helped thousands of students just like you pass their exams on the first try. Enroll in a course today, and be on your way to launching or expanding your career in the lucrative insurance industry!